If you’ve been hanging out around here for any length of time you’ve probably figured out that I go batty for Asian food in any form…but the Banh Mi Sandwich trumps them all for this gal. Remember this one? If you’ve never experienced a Banh Mi Sandwich I highly suggest you run your cute tush to your favorite local Vietnamese deli or food truck. You’ll usually find the crusty, chewy bread filled with savory pork and piled high with pickled veggies…and topped with a spicy mayo that will blow your mind. Again, getting giddier by the minute over here! 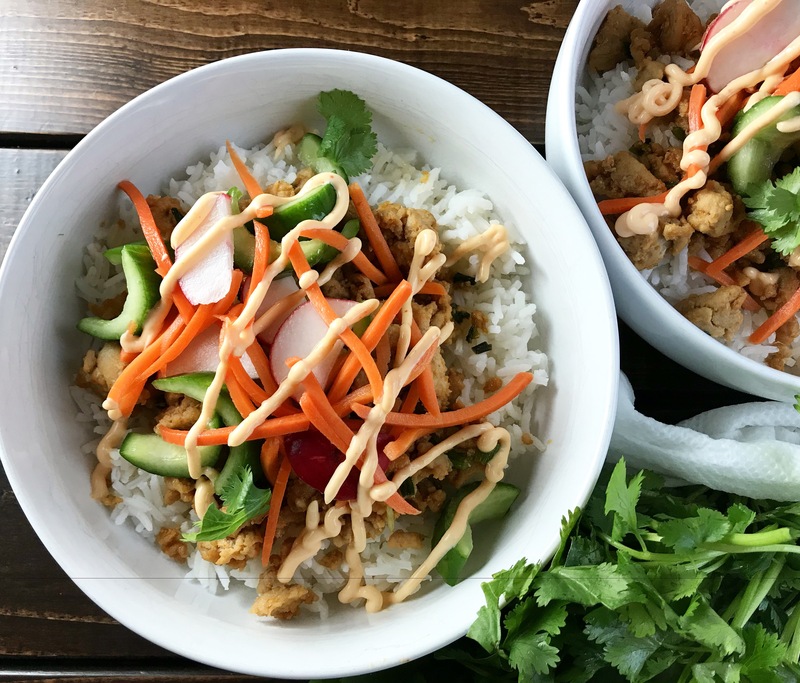 So I’ve turned my favorite sandwich into a healthy bowl that is easy enough for a weeknight meal and yummy enough that you may want to make a double batch so you can eat leftovers throughout the week. My whole family loves these…my husband and I eat them as-is and my weirdo kids demand cheese sprinkled on top so I just go with it; if it floats their boat I’ll surrender. These are so perfectly comforting for this chilly weather. 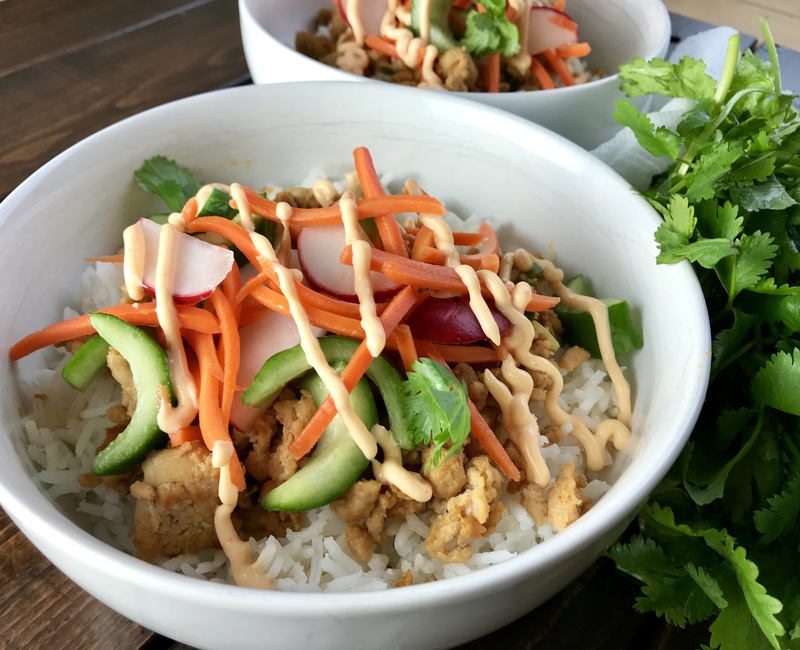 A big old bowl of your favorite grain topped with such a flavorful, warm, savory ground chicken, sweet, tangy, crisp veggies and a sriacha mayo that you just may want to go at with a spoon:) These are such a must-try! Stir all ingredients together in a medium bowl and let stand at room temp while you do the other steps. Can be made ahead and refrigerated for up to 3 days. Mix all ingredients together and set aside. Can be made ahead and stored in the refrigerator for up to 5 days. Heat olive oil in a large pan over medium high heat. Brown chicken, stirring occasionally, until cooked through. Stir in the remaining ingredients and let simmer for 5 minutes over medium low heat, stirring occasionally and season with salt and pepper to taste.